In prior posts I have written about Yoani Sánchez, the courageous Cuban blogger who has continuously held up the Cuban government to scrutiny. This evening I was browsing through many of the postings that indefatigable Cuban bloggers have sent up into the blogosphere and came across a video blog of Yoani Sánchez with English subtitles. Below, please find the link to this sixteen minute monologue of this brave writer who last week was denied permission for the nineteenth time to leave Cuba. I was impressed with the simplicity of her explanation of how she lives her life while criticizing the Cuban government. The key for her is to lead a transparent life so that if the government wishes to oppose her, it must come out into the open to do so, and not hide behind some anonymous bureaucrats who might otherwise falsify charges against her. I was also struck by her comment that she expects and does not want anything from the U.S. government, except to allow its citizens to interact with Cuban citizens freely. 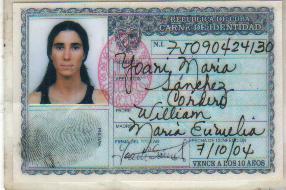 If that were to occur, she predicts, Cuba’s citizenry can develop autonomy from its government. Her call for freedom is modulated, yet constant. She is worth listening to.